Hi, we’re Ian and Tara Wells. We serve people who love exploring Sydney’s great outdoors on foot, but struggle to find the best walks, local favourites and insider info that transforms a walk into an experience. We give you the tools to get more out of every Sydney walking adventure, while making it feel like, well, a walk in the park. We’ve been doing this since 2009. Ian is a former hiking guide and Tara is an outdoor journalist and writer. So he walks and writes, but she writes and walks. Between us we’ve hiked in the Himalaya, Alps, Andes, New Zealand, and more. You know what all that international experience has done? Made us realise that what’s in our very own backyard is world-class. In fact, that’s why Ian started Sydney Coast Walks after a career in, ahem, corporate finance (let’s never mention that again)… at first intending to show overseas visitors the city’s natural areas but then realising that even Sydneysiders’ crave a big dose of walking to feed the soul. We’ve won multiple tourism awards – including Ecotourism and Adventure Tourism at the NSW Tourism Awards – recognising our passion for sharing Sydney’s best natural beauty. We’re partners in business and life. When we’re not walking, we’re wrangling kids. Three of them to be exact. So now we have the added challenge of hiking with young children. One day we’ll take the family thru-hiking. Top of the list is the Camino de Santiago de Compostela – Spain’s legendary pilgrim trail – mainly to combine our love affairs for experiencing a different culture with delicious food and wine. But it's a mistake to think that an aeroplane ticket is the only way to experience amazing walking. When you look for it, it can be as close as your own corner of the earth. Sydney is ours, so we've put together the best walks in Sydney. And we're leading the way by piecing together Sydney's Great Coastal Walk as Australia's very own long-distance trail. Come with us on the journey to get (re)inspired by signing up here for fortnightly updates. Can I do a guided walk with Sydney Coast Walks? 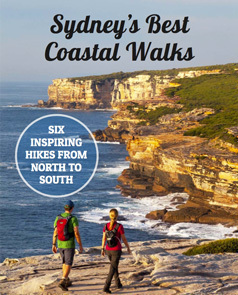 Sydney Coast Walks was founded as a tourism business offering guided walking tours. And we spent years introducing young people to their first overnight hikes as part of the Duke of Edinburgh's Award. But you know what happened? We got so busy taking others walking that we didn't have time to stop and smell the eucalypts. So now we're simply here to share our experiences, so you can discover it for yourself. Here are our self-guided Sydney walking tours. We walked from Manly to Bondi for our Honeymoon. Seriously. This is the track we were walking when we met (and that Ian has walked more than 100 times). This is what we like reading. By now you've probably worked out we love what we do and love encouraging more people to explore the outdoors on foot. Interested in hearing more about how you can work with us as a brand or destination? Work with us.